It’s been a difficult few years for NAMA Top 10 Clare-developer, Bernard McNamara (63). He was one of the first developers to admit that he was in grave financial difficulty following the collapse of the banking/property sector from 2007 onwards. NAMA had receivers appointed to a raft of his companies. 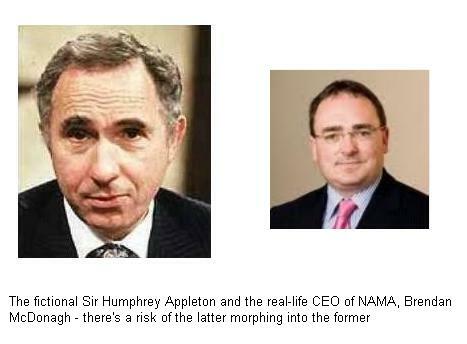 NAMA has sued him in Dublin’s High Court and last November 2012, Bernard was declared bankrupt in the UK. Bernard’s wife, Moira is apparently suing NAMA in the High Court and last year, there were a number of reports of Bernard dusting himself down and getting on with business in what might be considered an exotic location – Nigeria. Tomorrow, we are set to find out a lot more about that operation in Nigeria, with a Nigerian national taking legal action in Nigeria against McNamara Nigeria Limited and seeking to include an associated company, Dram Constructions Nigeria Limited, in the action. The application centres the rights and rewards accruing to the applicant, a Nigerian lawyer apparently, whose name is Uzoma Nwakuche. 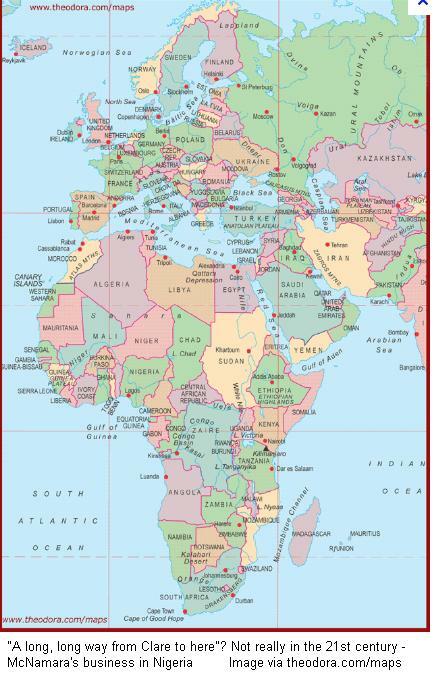 It is claimed by the applicant that the directors of McNamara Nigeria Limited, a company incorporated in Nigeria in July 2009, are Michael McNamara, James Godley, Jack Butler, Michael O’Brien, Pat Fox and three Nigerian nationals. There is all sorts of mud thrown in the application at an Irish dissolved company, Dramsaway Limited whose sole shareholder was Moira McNamara. 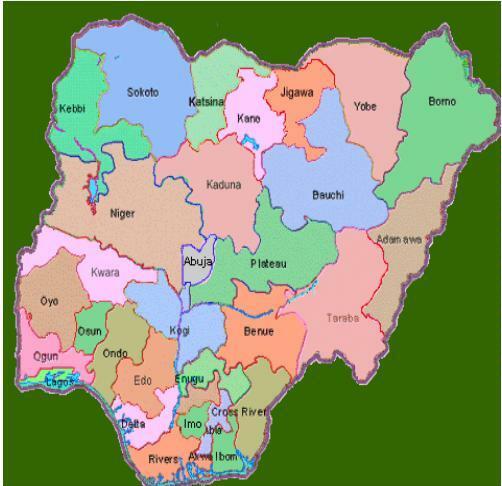 Papers seen by this blog purport to describe the history of the McNamara operation in Nigeria, and particularly the construction of a brand new university campus with housing in Sokoto, a state in Nigeria’s federated country, located in the north-west of the country. See below. We do know from previous traditional media reports that Bernard had some involvement in the construction of the university campus – he’s pictured here at the signing the contract – but Bernard has since gone to some lengths to distance himself from the operation, asserting that he was merely a consultant to the project. It is claimed in the applicant’s papers that the construction contract was worth €120m. The significance of the case and its relevance to the audience on here, appears to be the alleged degree of involvement by Bernard McNamara in the Sokoto university development, and how the alleged contract price was divvied out amongst participants in the project. The case reference at the Nigerian Federal High Court is FHC/ABJ/CS/727/2012 and the case is set to be heard from tomorrow. 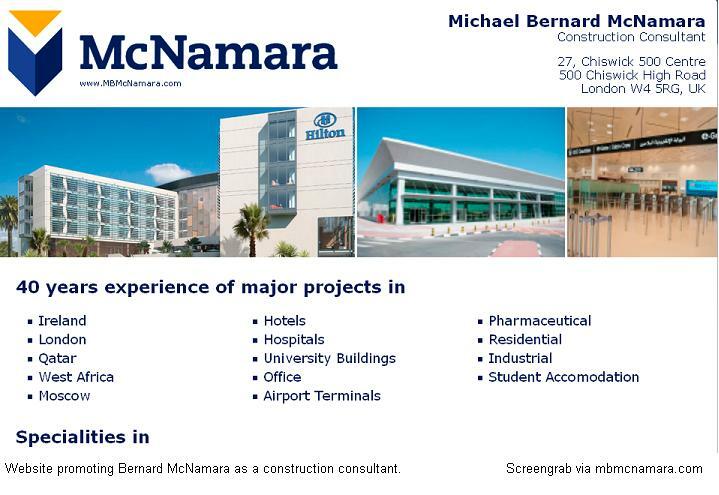 A request for comment was made to Bernard McNamara using his new website which promotes his role as a construction consultant, and to Jack Butler at AfricanMCConstruction but at time of writing there hasn’t been a response. UPDATE: 23rd January, 2013. A local Nigerian media outlet has reported on yesterday’s case and given part of the other side of the story. The case has been adjourned to 18th Febryary, 2013. Burning the bondholders – by how much have they been singed? 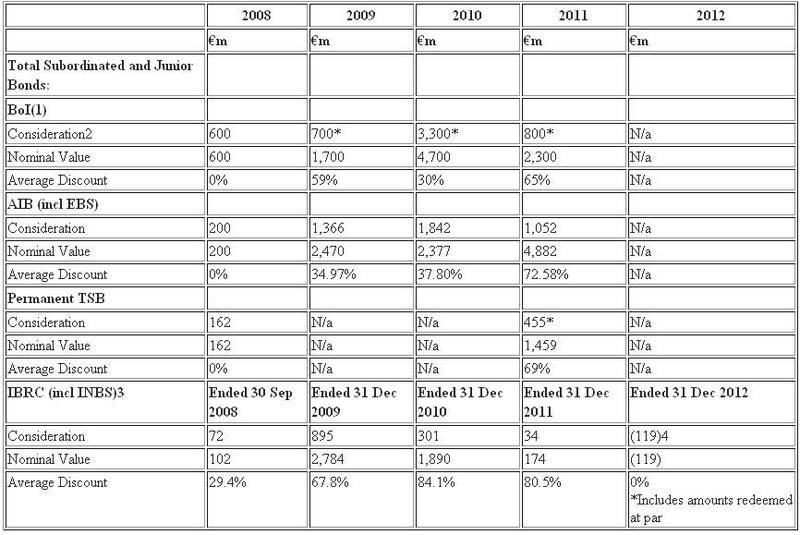 Although not a single senior bondholder in bust Irish banks has been left behind in our financial crisis and all have so far been repaid 100%, we have been burning junior – or subordinated – bondholders since 2008. By “burning” we mean imposing or negotiating a discount or “haircut” on loans provided by the junior bondholders to Irish banks. Junior bonds are loans by investors to banks are more risky than senior bonds, and the parlous state of Irish banks was used a justification to burn these bondholders. Unfortunately, the ECB has flatly refused to permit Irish banks to impose haircuts on senior bondholders, even the ones in the zombiest of banks, Anglo. So, how much have we burned? In the Dail last week, the Sinn Fein social protection and housing spokespersons Anegus O’Snodaigh and Dessie Ellis asked Minister for Finance Michael Noonan for the figures since 2008, the year in which our financial crisis really exploded. To date since the start of 2008, we have repaid €26bn of junior bonds, but we only paid €12bn meaning we imposed haircuts totaling €14bn or an average 55% haircut. Most of the haircutting was imposed during the tenure of the previous government, and pro-rataing the annual 2011 haircuts for 2 months representing the first two months of 2011 when the previous government was in power and adding those haircuts to the 2008-2010 haircuts, means that the previous administration was in power when about €9bn of the haircuts were imposed. The new administration oversaw €5bn of haircuts. And why didn’t we burn more? Minister Noonan merely says “I understand that these transactions were commercial decisions for the Institutions following consultation with their financial advisors” which is about as hands-off as you can get and contrasts with the lap-of-honour language being used in 2011. And why is Minister Noonan no longer trumpeting the €5bn of haircuts since he took over? Not sure, but one reason might be the series of law suits presently ongoing in the United States and the UK. We found out for the first time last week in the responses, that IBRC repaid €119m of subordinated bondholders in 2010 and imposed a haircut. One of the bondholders, a German company called Assénagon took Anglo or IBRC to court in the UK last year and won its case at London’s High Court which means that IBRC remains responsible for the haircut imposed on those bonds. That haircut isn’t public but in 2010, IBRC imposed average haircuts of 84% which, if applicable to the €119m of bonds about which Assenagon sued, would mean IBRC is liable to pay back €100m to those bondholders. In New York, Fir Tree is appealing the potential for a haircut, and Bank of Ireland junior bondholders are pursuing an action in the UK. Whilst IBRC has appealed the Assenagon decision to the UK’s appeal courts and the hearing is scheduled for March 2013, as things stand, IBRC and in fact the other Irish banks face a raft of legal challenges on the €14bn so far burned. That might be why Minister Noonan is suddenly silent. Deputy Dessie Ellis: To ask the Minister for Finance the process undertaken to redeem subordinated and junior bonds at the Covered Institutions, Covered Institutions (details supplied); and specifically the way the haircut offers were derived. Deputy Aengus Ó Snodaigh: To ask the Minister for Finance if he will set out in tabular form by year for 2008, 2009, 2010, 2011 and 2012 for each of the Covered Institutions (details supplied), the total subordinated and junior bonds repaid including the nominal value of the bonds, the sums actually paid and the haircut representing the difference between the two. Minister for Finance, Michael Noonan: I propose to answer questions 59 and 60 together. 1) BOI figures are rounded to their nearest hundred million. 2) Consideration provided as part of the Liability Management Exercises was in the form of cash, equity and other debt instruments. 3) Foreign exchange rates are as at end financial period. 4) On 27 July 2012, the English High Court delivered a judgement granting declaratory relief against IBRC in favour of Assénagon. The effect of the Assénagon judgement is that the redemption of certain dated notes by the Bank during November and December 2010 was invalid and consequently these notes therefore continue in existence on their original terms. The Bank continues to honour quarterly coupon obligations in respect of the notes pending the outcome of the Appeal. The purpose of the Liability Management Exercise (LME) transactions was to create additional core tier 1 capital and to strengthen the quality of the capital base of the Banks. I understand that these transactions were commercial decisions for the Institutions following consultation with their financial advisors. Sir Humphrey, the archetypal civil servant whose obsession in his fictional life was to avoid commitment and metrics which could come back to bite him on the bum. Has anyone tried searching foreclosed properties on the NAMA website recently? Now, NAMA knows that this is the most popular feature of its website. People want to know what property is potentially available so that they can contact receivers, and try to buy or develop the property. Last July 2012, NAMA made changes to its foreclosure list which is updated once a month, usually in the last week or on last working day in the month. On the face of it the changes gave users the opportunity to better search the NAMA database, but in practice, the errors in the database – documented here and here – mean that users still want to see the entire list, and not have to search through 150 pages of NAMA search results to see what is new. They also want to do their own searches and analyses and not be constrained by what NAMA offers. I know this because of messages received on here. But don’t take my word for it, when Gavin Sheridan’s thestory.ie website hosted a spreadsheet of the latest data that could be sorted and analysed as the user wants, NOT how NAMA wants, the spreadsheet was linked to on here, and in the past month, according to statistics on this blog, there have been 1,213 click-throughs. Yesterday on Twitter, Gavin confirmed to me that thestory.ie had “easily” received over 1,000 click-throughs in the last month. By contrast, there have only been 292 click-throughs from this website to the NAMA foreclosure search facilities. So, NAMA, it’s not difficult. Just provide a slight addition to your website – allow the entire database of foreclosed property to be downloaded in a searchable format, Excel or a spreadsheet would be best. And better still, when you update your database, just add in a new field, the “date added field” and allow searches or sorting on that field. In the Dail last week, the Sinn Fein social protection spokesperson Deputy Aengus Ó Snodaigh asked Minister Noonan about the functionality of NAMA’s website. This is the full parliamentary question and response. Deputy Aengus Ó Snodaigh: To ask the Minister for Finance the reason the National Asset Management Agency no longer produces a comprehensive monthly list of foreclosed property in a manner which would allow potential customers to easily see the additions during the month..
Minister for Finance, Michael Noonan: NAMA advises that, based on user feedback, the majority of users of its enforced properties website are interested in properties that are available within their own geographical areas for rent or purchase. NAMA has, in response to feedback from these users, significantly enhanced the functionality of the enforced properties website to enable interested parties to interrogate the listing of properties in a much more informative way. In particular, the enhanced functionality includes the facility to search for properties by property type and county/area and includes links, where applicable, to sales brochures. NAMA further advises that the enhanced website includes the option to search all properties that are subject to enforcement, including new properties which are added on a monthly basis. A user, therefore, interested in acquiring a property in a particular area is advised to re-visit the site on a regular basis to ensure that he or she has access to the most up-to-date data.